Start off your visit on the 1st (Sat): admire the striking features of Qutub Minar, contemplate in the serene atmosphere at Ayyappa Temple, and then indulge in some personalized pampering at some of the best spas. 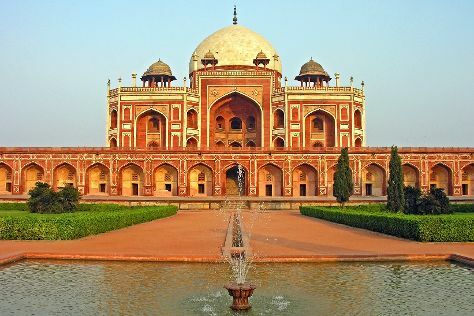 Here are some ideas for day two: take a stroll through Hauz Khas Village, admire the striking features of Humayun's Tomb, and then take in nature's colorful creations at Akshardham. To see maps and tourist information, you can read our New Delhi travel itinerary planner . If you are flying in from India, the closest major airport is Indira Gandhi International Airport. June in New Delhi sees daily highs of 45°C and lows of 32°C at night. Finish up your sightseeing early on the 2nd (Sun) so you can travel to Bangkok. Step off the beaten path and head to Ayutthaya Ruins and Snake Farm (Queen Saovabha Memorial Institute). Give yourself a bit of retail therapy at Khao San Road and Chatuchak Weekend Market. The adventure continues: admire nature's wide array of creatures at SEA LIFE Bangkok Ocean World, take in the spiritual surroundings of Erawan Shrine (Thao Mahaprom Shrine), examine the collection at Jim Thompson House, and don't miss a visit to Wat Pho. For maps, reviews, and tourist information, refer to the Bangkok driving holiday planner. Fly from New Delhi to Bangkok in 7.5 hours. Alternatively, you can drive. Traveling from New Delhi to Bangkok, you'll lose 1 hour due to the time zone difference. Traveling from New Delhi in June, you will find days in Bangkok are a bit cooler (39°C), and nights are about the same (30°C). Wrap up your sightseeing on the 6th (Thu) to allow time to travel back home.